The Chinese demonstrate that UHI has a real and essential effect on regional climate change | Watts Up With That? With the homogeneity-adjusted surface air temperature (SAT) data at 312 stations in eastern China for 1979-2008 and the Defense Meteorological Satellite Program/Operational Linescan System (DMSP/OLS) nighttime light data, the spatial heterogeneities of the SAT trends on different scales are detected with a spatial filtering (i.e. moving spatial anomaly) method, and the impact of urbanization in eastern China on surface warming is analyzed. Results show that the urbanization can induce a remarkable summer warming in Yangtze River Delta (YRD) city cluster region and a winter warming in Beijing-Tianjin-Hebei (BTH) city cluster region. The YRD warming in summer primarily results from the significant increasing of maximum temperature, with an estimated urban warming rate at 0.132–0.250°C per decade, accounting for 36%–68% of the total regional warming. The BTH warming in winter is primarily due to the remarkable increasing of minimum temperature, with an estimated urban warming rate at 0.102–0.214°C per decade, accounting for 12%–24% of the total regional warming. The temporal-spatial differences of urban warming effect may be attributed to the variation of regional climatic background and the change of anthropogenic heat release. It is evident that although warming signal becomes more obvious with the expansion of filtering window, the spatial patterns roughly keep unchanged. In summer (Figure 3(a)), the remarkable warming primarily confines to the YRD and eastern Inner-Mongolian regions. In winter (Figure 3(b)), the significant warming mainly locates in the BTH region. those in Du et al. and Ren et al. .
trends, respectively. It can be found that the urban warming in the YRD region in summer is primarily determined by the significant increasing of maximum temperature (Figure 4(a)), while that in the BTH region in winter is primarily due to the remarkable increasing of minimum temperature (Figure 5(b)). The temporal-spatial differences of urbanization effect may be related to the anthropogenic heat release . Several studies have indicated that anthropogenic heat in the YRD region is mainly caused by the air conditioning refrigeration, which is more intensive during daytime than night and eventually can increase the daily maximum temperature in summer [56,57]. Conversely, anthropogenic heat in the BTH region is primarily caused by winter heating that is more intensive during night, which favors the increasing of daily minimum temperature in winter [58–60]. 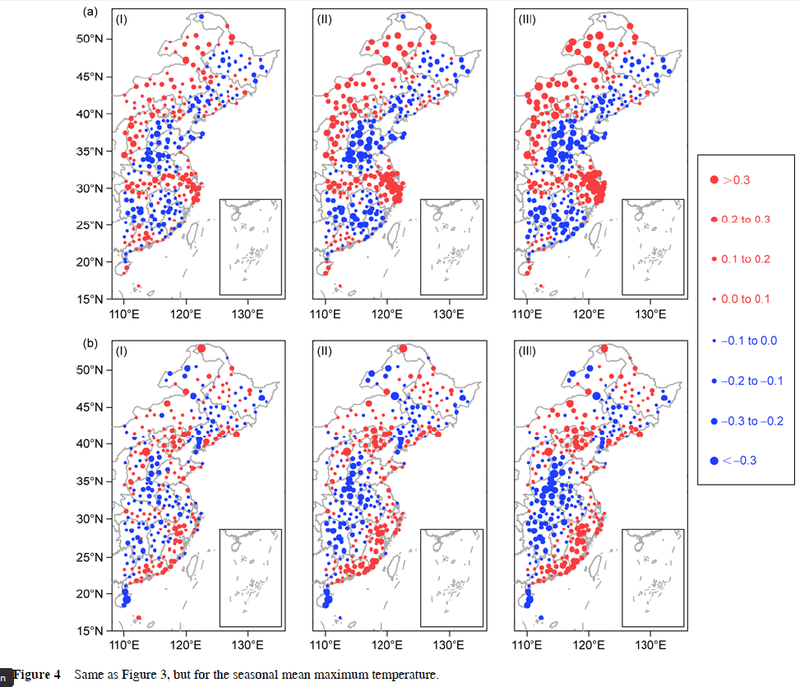 Additionally, winter maximum temperature also has increased in some other regions of northern and southeastern China (Figure 4(b)). The reason for such occurrences requires further investigation. the urbanization. Main conclusions are as follows. for 11.4% of total averaged warming in whole eastern China. spring, and relatively weak in autumn and summer. urbanization at a rate of 0.076–0.125°C per decade. is taken to analyze the SAT change in eastern China in this study. Despite there are a few controversies about the method of homogeneity adjustment, the adjusted data reflects temperature series more objectively. Furthermore, Peterson  argued that there was no significant impact of urbanization in observed records once the temperature series were adjusted for homogeneities. However, this study confirmed that an urban warming effect is still remarkable in the homogeneity-adjusted data. This is consistent with what we have learned in the surfacestations project and in the draft paper Watts et al 2012, especially about the homogenized data set. Sadly, the chinese refuse to release data for a large number of stations both rural and urban. I hope this paper is different, otherwise–no replication. no science. no cookie. The reason that the UN types will run away from the UHI affect is that is goes against their Agenda 21 plans for Sustainable Development. The plan puts people into urban areas and blocks off rural living. Stack and Pack housing is the goal. @ Mosher before doing your poo-poo dance, you should ask. Actually let me qualify that, we should have researcher at a University ask. I’ll get Pielke Sr. on it since he’s got quite a track record on LULC publications, they’ll likely see this as a beneficial collaboration. Hi, Paul, see table 2. on a regional basis… the difference is…… .05C per decade. Of course you can look at a smaller region and find higher rates. Looking at a one area and find a high rate, while you ignore other areas.. is kinda like the trick of looking at arctic ice loss while ignoring the south pole. Overall, the urbanization effect has obvious seasonal variation, which appears to be more significant in winter. I will add that they borked up the use of nightlights and used version 4 stable lights and a DN number of 55 as their discrimination value.. so they could actually be missing some of the UHI. The should be using radiance calibrated lights, otherwise they are just comparing very very urban to ‘not so urban” . Put another way, If you accept using stable lights as a Urban identifier, and if you accept using 55 DN as the cut off i do not think you will like the answer this process gives when applied to the whole world. That seems quite a reasonable rating. Remains a question : from how long this bias exists. Considering the origin of the phenomenon, we can assume that it goes back to the beginning or at least the first half of the twentieth century. Assuming 0.1 ° C since 1925, we’ll get a whole new story. It’s an authoritarian society, and while the results confirm what common sense tells us is true, the fact that the Chinese are contributing to the CO2 build-up more than any other country means that climate science that comes up with conclusions that might blunt the attacks on the Chinese for their reputed contributions to global warming needs to be viewed very carefully. People in authoritarian societies, and that includes scientists, will tend to curry favor with ruling elites. Well lets see. At my last visit to AGU i stopped by every poster using data from China. Exchanged business cards and inquired about acquiring the data. That is how I am aware of their policy about keeping some data to themselves.. you can see it as a way for their researchers to get publications. There was some really fascinating work.. all showing UHI. and the same grade we gave Jones. Again, for me the rules are simple. No data. No code, don’t expect me to believe. I dont care whether its Mann writing the paper or Jesus writing the paper. A paper that points out what we already know (UHI of around .05C per decade– much less than what Mckittrick shows for example ) that has no data or code supplied doesnt really help us understand or build on the science. Contrast this to your papers which supply the data and code. Those papers show people how to do it. Having shown people the power of open data and code, one can’t merely look the other way when we see results we like produced with methods we disapprove of. By accepting the principles of ‘Show your work” we move a step closer to taking politics and personality out of science. The high road is the only road to take here. Well you have to be careful or you will define the “natural warming of the 30s and 40s” out of existence. If you think its due to cars airports and skyscrapers… doesnt go back so far. Quite true. And people getting grants, and that includes scientists, will tend to curry favor with the ruling grantors… And mice, when they are trained to hit a button to get their food, will know to hit the right button to get more food. Did the Chinese just score an own goal? It would seem so. Mass air travel, took off in the 1970s. I envisage that the mass use of aircon is also a 1970s phenomena. In the UK, cars were relatively rare in the 1950s. Even by the 1960s every household did not possess a car. However by the 1970s 2 cars per household were common and by the 1980s/90s 3 or more cars per household were common. Not only was there much more car usage, people started tarmacing their front gardens so that they had somewhere to park all these cars especially in cities where housing is built tight together and on street parking is limited. Likewise central heating in UK homes is a 1970s/1980s phenomena. Before then, homes often had fires in only a couple of rooms and people went to bed with a hot water bottle, or an electric blanket. Of course, the US has always been a little more ahead of the curve, so matters may be slightly different in the US. It would not surprise me if UHI only became a material factor as around the 1970s onwards. That is also perhaps consistent with the satellite data which shows no significant warming between 1979 and 1997 whereas land based thermometer record does. It may well be that the land based thermometer record has been significantly polluted by UHI from the mid 1970s, perhhaps by as much as 0.05degC to 0.1degC per decade.. Of course after 25 to 30 or so years of urbanisation, the effects of UHI on trend begins to wane such that presently UHI may not now (say this century) be much of a polluter. Based on my quick read it looks like a pretty solid paper. In our recent paper we found that century-scale UHI bias in the U.S. was on the order of 5% of total observed min temp warming in the homogenized data. Finding a residual bias of around 10% in China during a period of rapid urbanization seems reasonable enough. The paper took a similar approach to us in using nightlight-based classifications for urban/rural distinctions. I don’t know enough about the homogenization procedure applied to the Chinese data (as it was their own method, not that used by NCDC) to judge how effective it would be at detecting and removing urbanity-correlated trend biases. I also wish they had shown how big the bias was in the raw data, to get a better sense of what effect homogenization is having. Also, as Mosher mentioned, it would be nice if they released the raw data. The fact that most Chinese station data has not been available to researchers outside of China has always made it tough to analyze Chinese UHI. Who influences scientists the most? Governments that bribe with money or governments that threaten with pain. Absolute governments do not need consensus or crisis. About EU tarriffing Chineses PV solar panels. Mosher, thanks for enduring. Not everyone is so singleminded. I’ve long wondered why people aren’t taking UHI more seriously. If 10% of land mass (urban areas, agriculture, roads, dam lakes, etc..) has albedo half the natural value, it’s a huge contributor to global energy budget. FINALLY someone points to air conditioners as being a factor! Since weather stations measure temperature outside, it only makes sense that if we are removing heat energy from inside buildings that it has to be adding to the heat content (and thus temperature) outside. I would wager that the air-conditioner effect (ACE) is larger than the ACTUAL CO2 effect.
. . . Now back to reading this post. It should be a good one! The difference between CAGW and irrelevant AGW is mere points per decade. Any inappropriately handled UHIE is important. We must keep firmly in mind my first statement: points per decade count. We do not have just the UHIE, but the overall station adjustments to harmonize instrumental, time of measurement, location changes and the algorithms to fill-in no-data areas. 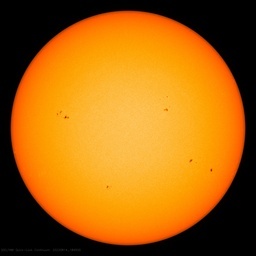 Each has a clear warming bias that individually is said to be insignificant but which adds together to be significant. The IPCC position is that their data is hard. Though error bars exist in principle, they do not exist in practice, largely because MSM doesn’t understand error bars, but also because the engineering mind cannot handle uncertainty (calculations require fixed points and the black-or-white attitude cannot tolerate gray). The simplest way of seeing our problem is the AR5 graph of Scenarios with the observational profile laid on it: prior to 2013 no longer matters. Whatever lead to here was wrong except for the profile that we observed. Whatever we have by the year 2100 has to start from today and build from what happened yesterday. Lawson just said we could have a 5C increase due to CO2, far beyond Scenario A, but which Scenario takes us to there from 2013? None. Does this mean that ANY up and down that goes from today to 2100 is equally valid, that the error bars can be construed as the limits to random wandering that is the NATURAL way the world reacts to warming influences? If the IPCC weren’t so adamant about the future being so settled and certain, the UHIE and other problems would not be serious. They are being hoisted on their own petards, fortunately. Only 10 times larger than climate science / IPCC used to say. Only 100 times larger than the effect after homogenization according to Hausfather, Mosher and the NCDCcru /crew. I would argue that, since China had over a billion people in an area the size of the continental USA even before 1980, even the pre-urbanization would have been creating land-use effects on the climate. This would to some extent minimize the increase since 1980, it would seem. However, I recently found that there are now 93 (!) urban areas in China with a population over 1,000,000. That is out of 492 in the world – pretty much one out of every five in the world. So China should be THE place to look at the UHI, whether it exist or not. And given that the Chinese more or less give the middle finger to westerners about most things, I would expect the Chinese to not be influenced by the IPCC-UEA cadre and come up with results that are not affected by “Mike’s Nature trick” and such distortions. It’s been taken seriously quite a while now, by skeptics/climate realists. UHI, poor station siting, and station drop-out have been skewing the temperature records upwards, meaning the actual warming is much less than what has been reported. What it adds to the energy budget is miniscule. I do not doubt the general thrust of this paper. Details are another matter. We know that large scale use of energy in cities affects local temperatures and this spreads out to some degree to the surrounding countryside. It is easily observed particularly in countries with dense and close packed urban areas with little countryside between them like the UK. Similarly changes in land use for agriculture, forestry, irrigation and so forth affect small regions of the earth’s surface. The important word is small. Two thirds of the globe is covered with water and large human settlements and even cultivated areas comprise only a fraction of the remaining third of the land surface. Globally the effects of these heat sources is not only trivial but probably imperceptible. As are the effects of fossil fuel emissions on the global composition of the atmosphere. The vast natural forces that drive the great weather systems of the earth if not totally beyond our comprehension are certainly beyond our ability to either affect them or predict longer term fluctuations in them. And no amount of imprecise measurement and statistical trickery can make it otherwise whatever those who advocate CAGW might urge to the contrary..
0.4 degrees C/decade, after removing the UHI effect. That’s some pretty impressive warming trends right there! This appears to be a d(dUHI) study, computing how much faster very rapidly developing regions warm compared with the rest of Eastern China, which, of course, has seen development as well. Therefore, a dUHI threshold would be present in the “blue points” as well, and still needs quantification to be added to this result.. Insulation. Assuming that the demand for air conditioned space is only going to get higher, these people need to learn to thermally design their housing for the best cost effectiveness on the planet. Structural- thermal-foam cement blocks? Never mind the CO2, I would appreciate not sharing the extra NOx, SOx, metal and particulates. UHI effect is real and varies with ambient temperature so has to be taken into account when claiming ever higher temperatures. The difference between UHI enhanced and ambient temperatures can be the same as the claimed temperature rise due to the GHE. I agree, and this is the key. Most people genuinely do not comprehend how vast this planet is, and we are only on a minuscule portion, no matter how great our works look from our perspective. Seems to me that people in rural locations comprehend this, while the more dense the urban areas the more likely their inhabitants think it’s all that way. Satellite views should make this more apparent, but they seem to have the opposite effect. Try flying coast to coast over Canada…. you’ll get a very realistic view of how huge this continent is, and how little of it is urbanized. Let’s hope Dr Phil Jones (CRU) takes note of this study. He of all people needs to!!! !